As a total self-confessed foodie, doing street food tours in local areas of places I travel to is one of my favourite things to do. It's especially a great idea for when you've just arrived in a new place, to be shown and get great insight to the local food as well as the lay of the land, as most food tours tend to be walking. Thai food is one of my top favourite cuisines in the world and sadly I haven't been able to have much of it since my last trip four and a half years ago, as compared to what you get in Thailand, it's always just been so disappointing to me! 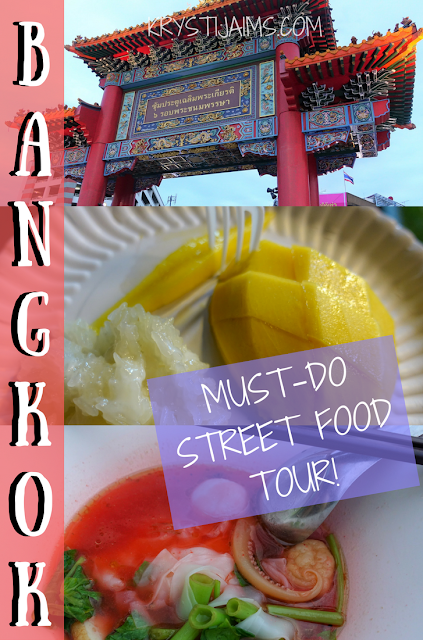 Excited to be back in Bangkok, I immediately did some research and found the highly rated Bangkok Food Tours. They offer a range of different tours, including a Historic Bangrak Food Tour, Offbeat Floating Markets Food Tour, Midnight Food Tour by Tuk Tuk, a Yaowarat Street Food Tour and many more. I decided to go for the latter, as I had never been to the Chinatown area before and I had heard it was a most excellent place for street food. Read on to hear all about the Yaowarat Street Food Tour with each dish we tried, what I thought of them and why you should do this tour too if you're coming to Bangkok! Our group and guide all met outside Bangkok Centre Hotel next to the Hua Lamphong MRT station, where we first introduced ourselves before walking to nearby Yaowarat (Chinatown). Our first dish from the cart pictured above was called Yen Ta Fo, a beloved pink noodle dish with some interesting ingredients in there! We were told this particular cart ranked in the top five for this dish in the whole of Bangkok. It was really delicious and so full of flavour. Thai food prides itself on being sweet, sour, spicy and salty all at the same time and this was no exception. 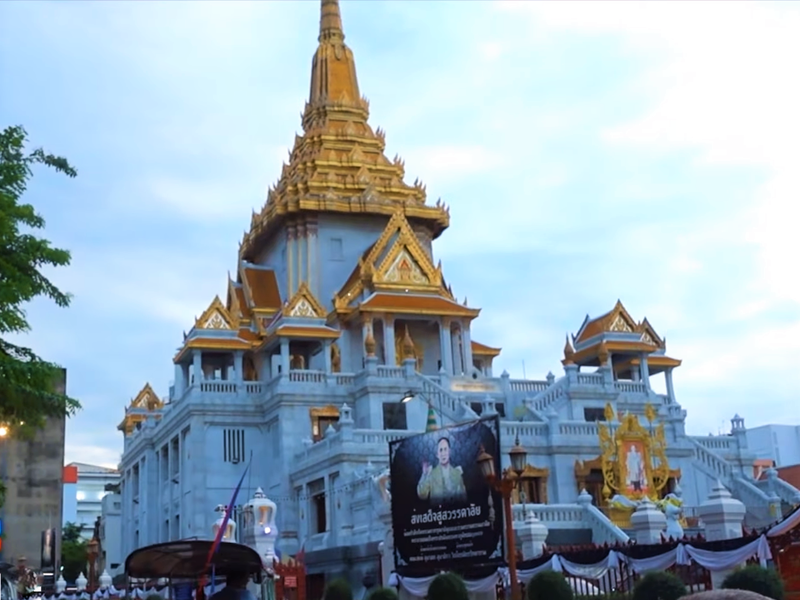 We also had an incredible view, sitting right in front of Wat Trimit which holds the famous Golden Buddha. We continued into the heart of Chinatown, passing a big Paifang (Chinese arch) and went into a restaurant called The Canton House. Here we tried two different dishes, first a big spicy crispy duck salad that we all shared. Every mouthful was so fresh and zingy! The next dish was steamed dim sum which came with a spicy Thai 'killer' sauce (it wasn't that spicy for me!). They were absolutely delicious, I devoured them. We walked further down the bustling street, all lit up and colourful at night towards a cart that was serving my all-time favourite Thai food. Can you guess what it is? Mango sticky rice! I am so addicted to this delicious sweet dessert. We each got our own portion of it and it was so good some of the boys went back for seconds (I wish I could have fit more in but there were still many more dishes to try!). We passed by a durian cart and as most of us had never tried it before, we asked if we could. Durian is known to be the 'King of fruit' in Thailand and it is one of the fruits that you either absolutely love or hate with a passion. I was very interested to try this smelly fruit, that most hotels ban and have a hefty fine for bringing in. And... I did not like it! Which is surprising because I do like most things. I found the texture just so odd, wrongly odd and the taste was not pleasant at all. But I was glad to have tried it finally! Our next stop was at a busy local road-side restaurant sitting on little rickety stools at a popup table. We had a super spicy stir-fry prawn dish with rice and a sauce and Morning Glory, a popular green vegetable dish stir-fried with oyster sauce. The flavour combinations of everything were so delicious, I absolutely loved it. I was starting to get quite full by now though! It was so great sitting outside among the locals, really getting the feel of the lively neighbourhood. Our final stop was at a very popular street cart, famous for this particular best noodles found only in Chinatown, Bangkok. We had a spicy noodle soup with crispy pork belly - which was heavenly! I'm not normally a fan of pork belly, but I enjoyed this so much I ate every last morsel. The flavours of the broth and crispiness of the pork were absolute food goals! There was nowhere to sit, we just ate it standing up along with everyone else, the place was packed with people. Finally, for dessert we squeezed in one more tasting, which actually I think was my favourite of the night! It was called Sala Bao, a steamed bun and it was lava custard! You bit into it and the warm custard oozed out, it was so yum! It was the absolute perfect way to finish an epic night of street food tasting. 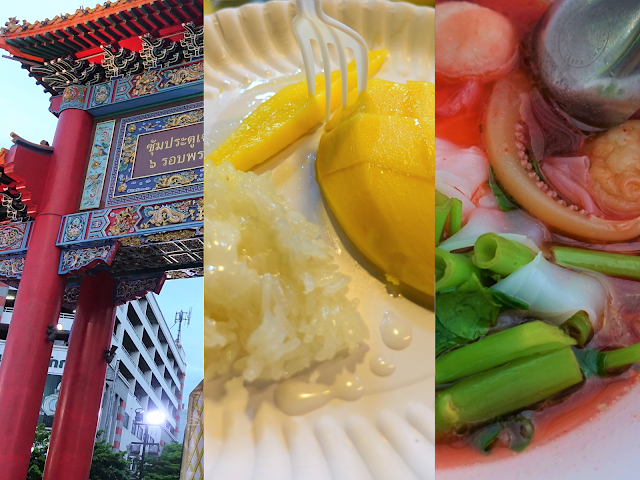 This tour was one of the highlights of my time in Bangkok, I really enjoyed trying such a variety of dishes from popular local spots. The food was high quality, fresh and delicious, I have no doubt we were taken to try the very best the city has to offer. I honestly loved every single thing we tried except for the durian! Our guide was so lovely and informative, we all learnt a lot about the history of each dish and where it came from. Yaowarat is a famous area in Bangkok for street food and I've heard it's where the locals tend to go when they want to treat themselves. I highly recommend this tour and any of their others if you are coming to Bangkok yourself, it was a fantastic foodie experience and a cultural one as well. One of the couples on my tour said they had done Bangkok Food Tour's Midnight Food Tour by Tuk Tuk the last time they were in Bangkok and they absolutely loved it, so decided to do another of theirs this time. I can tell you, I will absolutely be doing more of their tours when I am next in Bangkok again too! If you would like to see a bit more I highlight the tour in the second half of my Bangkok travel vlog for YouTube. Start at 3:07. Disclaimer: This tour was discounted in exchange for an honest review. All opinions are as always my own. Durian is a must-try fave! I love mangoes too with the sticky rice! Beautiful photos and descriptions of all that amazing food! Thanks! Omg that sounds amazing. So much food I can't imagine finishing it all. I can't believe that fruit is banned by the hotel that's pretty crazy. It def did not look like a fruit in the picture more like baked custard. Don't think I would have liked that either. But the sticky riced looked good and the prawns. Sounds like a great trip to me. I love Thai food! I dunno if the restaurants in my country serve as authentic and taste the same as the real thing. My fave is the sticky rice with mango! I always order that to end my meal.